3. URL of spoof website disguised as "Login to Online Account ". 4. Real URL looks nothing like SouthTrust! 5. Website traced to Kyonggi, Korea. 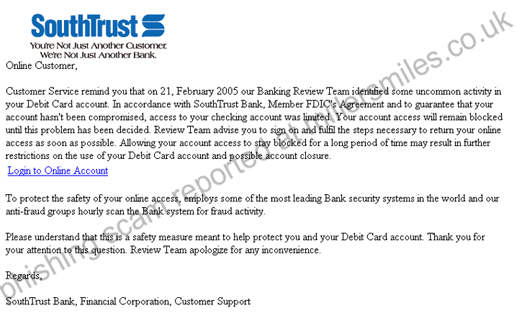 "Online Customer, Customer Service remind you that on 21, February 2005 our Banking Review Team identified some uncommon activity in your Debit Card account. "